Hannah Batsel captivates her viewers with fascinating artwork that springs from her interest in Victorian taxidermy and contained environments. She comes to Columbia with a BFA in printmaking yet she leaned toward book arts and found Columbia’s CBPA program through a recommendation by a professor. In between finishing her BFA at the University of Georgia and coming to the InterArts program at Columbia, she taught English in Korea to 2nd – 6th grade students as well as adults from 2011 – 2013. While she was in Korea, she exhibited her work with a local guild. 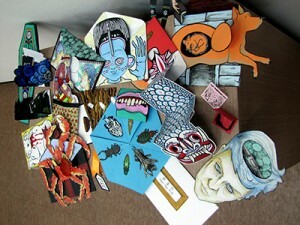 In that period she focused on mail art with colorful hand painted envelopes and pop-up letters. At the exhibit, viewers pulled the art out of a mailbox onsite and were able to browse through her creations. Batsel collects natural history books from the late 1800s and has begun to restore them. 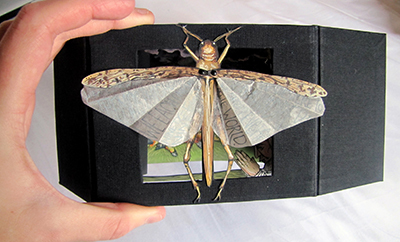 The books inspired a recent locust-based artwork through the anecdotal myths described in the history books, which unlike current books on the natural world, often veered from scientific explantions. Locusts in particular have a record in folklore that Bastel used in her work. In her graduate work, she also creates miniature environments inside of test tubes that have evolved from her interest in nature. 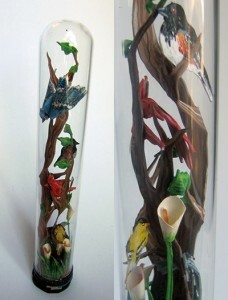 The tubes are filled with tiny paper representations of birds and plants. To find out more about Batsel’s work, click here.